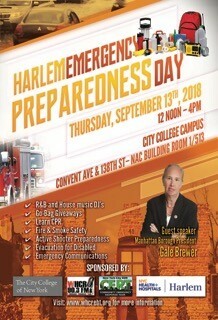 Join us at the Harlem Emergency Preparedness Day event on Thursday Sept. 13, 2018. This exciting and informative event will feature the opportunity to learn CPR, fire & smoke safety, active shooter preparedness, and much more. Guest speaker will be Gale Brewer, Manhattan Borough President. We look forward to seeing you there.